KABUL, Afghanistan (AP) -- Afghan officials say that security forces have arrested five people suspected of being involved in a massacre last month that saw extremists attack a military school in Pakistan, killing 148 people, most of them children. The two officials told The Associated Press on Saturday that the men, all Afghan nationals, helped support the assault at the Army Public School and College in the city of Peshawar. They say the men were all arrested in recent weeks near Afghanistan's eastern border with Pakistan. The officials spoke on condition of anonymity as they weren't authorized to brief journalists about the arrests. 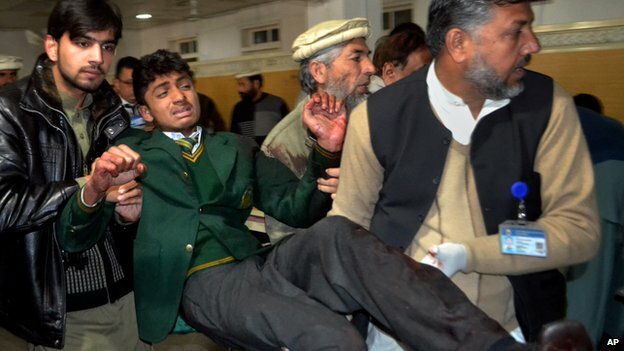 The Taliban claimed responsibility for the Dec. 16 attack on the school. The militant group is active in both Afghanistan and neighboring Pakistan.